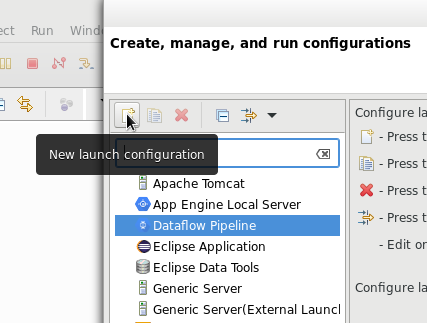 This page describes how to create a Cloud Dataflow project and run an example pipeline from within Eclipse. The Cloud Tools for Eclipse plugin works only with the Cloud Dataflow SDK distribution versions 2.0.0 to 2.5.0. The Cloud Dataflow Eclipse plugin does not work with the Apache Beam SDK distribution. See the Cloud Tools for Eclipse plugin release notes for announcements about new or updated features, bug fixes, known issues, and deprecated functionality. Ensure you have installed Eclipse IDE version 4.6 or later. Ensure you have installed the Java Development Kit (JDK) version 1.7 or later. 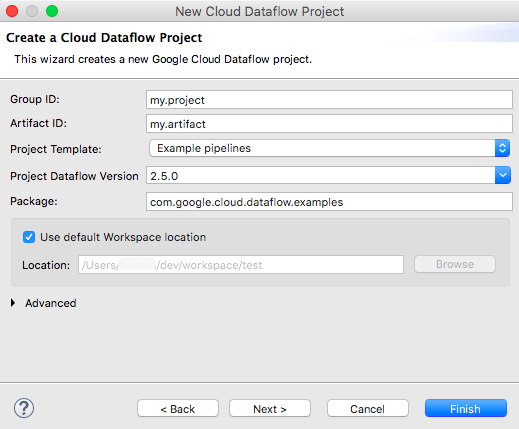 Ensure you have installed the latest version of the Cloud Dataflow plugin. 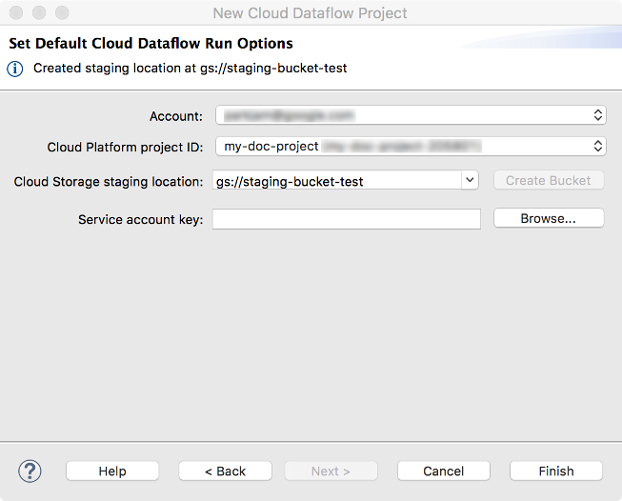 If you have not done so already, follow the Cloud Dataflow Quickstart to install the plugin. Or, select Help -> Check for Updates to update your plugin to the latest version. To create a new project, use the New Project wizard to generate a template application that you can use as the start for your own application. If you don't have an application, you can run the WordCount sample app to complete the rest of these procedures. 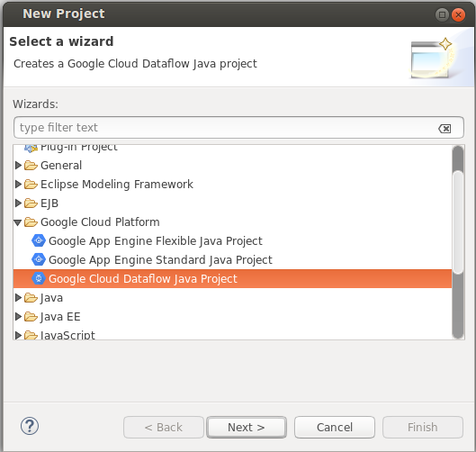 In the Google Cloud Platform directory, select Cloud Dataflow Java Project. Select the Project Template. For the WordCount sample, select Example pipelines. Select the Project Dataflow Version. For the WordCount sample, select 2.5.0. Enter the Package name. For the WordCount sample, enter com.google.cloud.dataflow.examples. 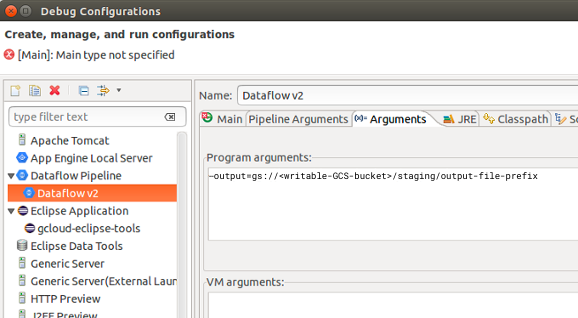 You should now see the Set Default Cloud Dataflow Run Options dialog. Select Add a new account... in the Account drop-down menu. A new browser window opens to complete the sign in process. Enter your Cloud Platform Project ID. Enter a unique name for Cloud Storage Staging Location. Location name must include the bucket name and a folder. Objects are created in your Cloud Storage bucket inside the specified folder. Do not include sensitive information in the bucket name because the bucket namespace is global and publicly visible. Click Browse to navigate to your service account key. After creating your Cloud Dataflow project, you can create pipelines that run on the Cloud Dataflow service. As an example, you can run the WordCount sample pipeline. Select Run -> Run Configurations. In the left menu, select Dataflow Pipeline. Click Browse to select your Cloud Dataflow project. Click Search... and select the WordCount Main Type. Click the Pipeline Arguments tab. In the Program arguments field, set the output to your Cloud Storage Staging Location. Click Delete to confirm that you want to permanently delete the bucket and its contents. Read about the Dataflow Programming Model.